Four decades ago this week, Jack Nicklaus’ Muirfield Village GC officially opened. It has made quite a mark in the game. Sure, there was a template, a source of inspiration. And there were historical markers on which to draw optimism for the audacious idea percolating in his always-churning mind. But Jack Nicklaus still scored a 10 for originality. The dream was all his. And his ability to see that dream through simply proved to be a reflection of how he conducted himself during his legendary playing career. He was determined. He gave the absolute best of himself. He was uncompromising in his demand for excellence. That is the story of the birth and evolution of one of Jack Nicklaus’ greatest achievements—Muirfield Village Golf Club, which on Tuesday of this week, May 27, turned 40 years old. It was on that date in 1974—Memorial Day—that Nicklaus and fellow Ohioan and Ohio State University standout Tom Weiskopf together cut the ceremonial ribbon and played the first official round at Muirfield Village. Nicklaus was so nervous on that warm afternoon that he could “only” manage a 6-under-par 66, the course record that endured for nearly a decade. The Memorial Tournament began two years later to the day with a splashy celebration that paid homage to the game’s past and helped pave the way towards the elevated standards of organization and course preparation that today have become expected in tournament golf. Nicklaus was just 24 years old when he first began rudimentary discussions with family and a few friends about the possibility of bringing an annual professional golf tournament to his hometown. That was in 1964, not long after Columbus Country Club had hosted the PGA Championship. The Golden Bear was in his third year as a touring pro then, had won only three of his record 18 professional major championships, had never designed a golf course, and he had not accumulated the kind of financial resources to which today’s golfers are accustomed. It was inspired and ambitious and ineffably daunting, but the indefatigable Nicklaus conquered a series of overwhelming obstacles to bring his dream to fruition. Few people outside of his inner circle of friends were aware of the myriad challenges, including the acute financial strain on the young Golden Bear. The late Mark McCormack, founder of IMG, who was handling Nicklaus’ business affairs, had tried to dissuade his client from such a massive undertaking because he was genuinely worried about the risks Nicklaus alone was assuming. During one of the darker moments in the developing years, as conversation turned from the staggering financial and logistical complications to that of naming the course, supporters around Nicklaus jokingly began referring to the project as, “The Anvil,” because it was becoming an increasingly enormous weight on everyone’s shoulders. “Muirfield did cost me a little. It nearly cost me a lot. But I didn’t care. It’s what I wanted to do,” said Nicklaus, who structured the business of the club so that he would never make any money from it. “I wanted to provide a great tournament to the people of Columbus who supported me, and I wanted to give something back to the game of golf. Inspired by Augusta National Golf Club and the Masters Tournament—the template, if you will—Nicklaus early in his career pondered whether a tournament of similar excellence could be successful in Columbus. Then came the 1964 PGA, and the reception Central Ohio fans lavished on the championship—in which Bobby Nichols outdueled Nicklaus (the defending champion) and Arnold Palmer—provided confirmation that Nicklaus might be onto something, and so he began to discuss the idea with his father Charlie and friends Ivor Young and Pandel Savic. He even broached the subject with veteran sportswriter Paul Hornung of The Columbus Dispatch. After all, except for Ohio State University football, there weren’t any major sporting attractions in Columbus, and there hadn’t been a regular tour event since the Columbus Invitational from 1946-48. By 1966, Nicklaus had grown sure that his idea had possibilities, and at the Masters that year he engaged Young in further discussions. It was there in the house he had rented in Augusta, Ga., where he entrusted his attorney friend with the task of finding suitable property to get the mission off the ground, so to speak. Dye, it turns out, was not exaggerating. Dave Stockton, who thought Muirfield Village was one of the hardest courses he had ever seen when he competed in the first Memorial, says the marriage of Nicklaus’ vision with the property on which it is built is as meaningful as any in the game. The seaside turf on which Pebble Beach Golf Links lingers has been called “the most felicitous meeting of land and sea in creation.” Along those lines, Muirfield Village is one of the most fortuitous meetings of imagination and real estate. The original purchase of 180 rolling, sylvan acres was finalized in September of ’66. Over time, Nicklaus acquired 1,580 acres, most of which was transformed into the residential community that surrounds the course. The lush playing ground that winds through trees, moors (or muirs, in Scottish) and creek beds, sits on 240 acres. Construction began on July 28, 1972. By that time, Nicklaus had been involved in nine design projects with Dye, who had introduced the young Bear to the business on a consultation basis starting at The Golf Club in nearby New Albany. And if that didn’t make it enough of a challenge, consider the timing. Nicklaus was in the prime of his playing career, the game’s dominant star. He won a career-high seven times that season, including the first two majors, the Masters and U.S. Open, and he had come within a stroke of adding the third leg of the Grand Slam at the Open Championship at Muirfield, where Lee Trevino beat him by a stroke thanks to a fluke chip-in at the 71st hole. Though there were schematics to which Dye and land planner Desmond Muirhead contributed, Nicklaus was designing Muirfield Village almost entirely as he went along, requiring him to be on the site almost constantly when not competing. “It was mainly by-the-seat-of-my-pants design,” the Bear says jokingly. In 1973, he won seven more times while construction stretched into late September because severe weather hampered progress, if you can believe that. Of course, long before then he had settled on a name: Muirfield Village, in honor of Muirfield, the course of the Honourable Company of Edinburgh Golfers in Gullane, Scotland, where he first played in Great Britain in the 1959 Walker Cup, and where, in 1966, he won his first Open Championship to complete the career Grand Slam. It made further sense since the property sat in a low valley, or moor. Though Nicklaus would further glean inspiration from the British Open—for instance, the Claret Jug is incorporated into the Muirfield Village crest, though it appears backwards as a gesture of respect for the championship—there was no question where he would take many of his cues in the conduct of his club. On Wednesday, November 13, 1974, The Columbus Dispatch reported a major golf tournament would be held at Muirfield Village. Not surprisingly, the Dispatch referred to the tournament as “The Masters of the North,” after Nicklaus said his tournament would draw heavily in style and flavor from the Masters. Nicklaus solicited advice from Clifford Roberts, the longtime chairman of Augusta National. Roberts also agreed to serve on the Captains Club (fashioned after a similar group from the Honourable Company), which is comprised of esteemed golfing personalities who advise on Memorial Tournament policy and select the honorees. The Memorial Tournament debuted on May 27, 1976, and from the start it was obvious that Nicklaus had created a truly unique PGA TOUR event that not only invited the game’s best players from the U.S. and abroad, but also sought to honor the memory of individuals living and deceased who had distinguished themselves in the game. Robert T. Jones, Jr., who had been a hero to Jack and to his father, was the first honoree. Roger Maltbie, not quite as famous then as he is today as an NBC Sports golf reporter, was the tournament’s first winner. What professionals encountered when they arrived for the inaugural Memorial was a golf course in immaculate condition and evincing bedrock Nicklaus design features: generous fairways, challenging and well-protected greens, and holes routed predominantly downhill so that the challenges of the layout readily presented themselves. Also unveiled to tournament golf was a groundbreaking concept Nicklaus referred to as “amphitheatering”—mounding on the periphery of playing areas that offered patrons unobstructed views. The Stadium Course at TPC Sawgrass, designed by Dye, is often credited with introducing the concept of stadium golf, but Muirfield Village predates TPC Sawgrass by two years. Which is something that hasn’t gone unnoticed by golf’s governing bodies. 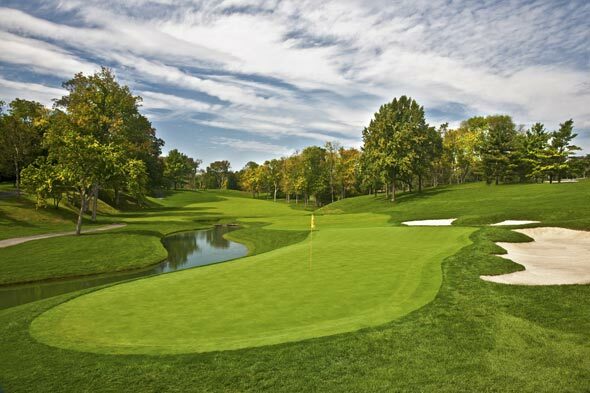 Muirfield Village Golf Club is the only venue in history to host The Ryder Cup, The Solheim Cup and The Presidents Cup, the latter held just last year and won by the United States Team. The U.S. Golf Association also has found its way here for a number of its national championships, including the 1986 U.S. Junior and the 1992 U.S. Amateur—won by Justin Leonard, but also significant as the first visit to Muirfield Village for five-time Memorial winner Tiger Woods. In addition to Nicklaus and Woods, many of the game’s greats have won the Memorial Tournament. That list includes Tom Watson, Raymond Floyd, Hale Irwin, Curtis Strange, Greg Norman, Fred Couples, Vijay Singh, and Ernie Els—all of them in the World Golf Hall of Fame. Indeed, as the years have peeled away, Nicklaus has kept most busy with managing the evolution of the golf course. There have been nips and tucks everywhere, and there have been significant changes, like the wholesale redesign of the 17th hole in 2002 and the 16th hole in 2011 in preparation for The Presidents Cup. The course yardage at the outset was 6,969 yards, but only two years later it was stretched to 7,027 yards for the first Memorial Tournament, with most of that additional length tacked onto the sixth hole, thanks to a suggestion from Weiskopf, one of the earliest members and an avid supporter of Nicklaus’ project. The course measured 7,101 yards in 1977, when the Golden Bear won the first of his two Memorials—and contemplated retirement right there on the spot until Barbara intervened and talked him out of it. It cracked 7,200 yards (7,221) in 2001 when Woods won his record third in a row, but only four years later 7,300 yards was its maximum distance. This week, the Tournament course can play up to 7,392 yards after the iconic par-4 home hole received a new tee that added 40 yards, making it 484 yards and restoring the original strategy to the dogleg right hole. While nature has made incessant and unexpected alterations, including the loss of significant but aging trees at Nos. 2, 6 and 18, Nicklaus hasn’t been shy about infusing his design with stronger shot values, as he has done at holes 16, 17 and 18, giving Muirfield Village one of the strongest trios of closing holes in golf. The short par-4 14th is another example of putting more spice into a hole. After the first Memorial, the bunkers to the left of the green were deepened, and Nicklaus added the lake that now guards the right side. Conversely, Nicklaus at times has made the course more conducive to scoring, such as when he removed a pond in front of the 11th green that wasn’t visible from the fairway because he disliked hidden hazards. And in 1984, on the same hole, he added a front apron to the green and removed excess foliage to make it easier for players to reach the putting surface in two. Nicklaus calls Muirfield Village a labor of love, but it’s been more than that; it’s been an intricately woven part of his life, a representation of the excellence he had always exhibited as a golfer expressed in another manner, one that further defines his ideals and commitment to the game. Forty years. Add the nearly decade-long odyssey from the first seeds of inception to today and you have a half-century, a lifetime in itself. That’s quite a monumental investment for anyone to make for one enterprise, but that’s what it takes when a man has the fortitude to transform a dream into an enduring stroke of genius.